As a local Charity we have addressed the challenge of how can we help to break the cycle of disadvantage and make a real difference to our young people who are unable to read in Woking. Poor literacy skills seriously disadvantage young people and greatly increase their risk of underachievement at school, truancy and experiencing social exclusion. Poor literacy in adults has been linked to unemployment, poverty, financial exclusion and offending behaviour. Lack of basic literacy skills is linked with low esteem, academic failure, substance abuse, teenage pregnancy, delinquency, unemployment, low productivity and welfare dependence. Literacy is an individual’s ability to read, write and speak in English at a level of proficiency necessary to function at school, at work and in society and to develop one’s knowledge and realise their full potential. In the UK today more than 34,000 young people leave school every year with no qualifications. Providing books to young people is a simple, effective and relatively inexpensive way to promote language and literacy growth. Owning books is a critical feature of every child’s intellectual development. Reading aloud to children is the single most effective parental practice for enhancing language development. Children with books at home are eight times more likely to list reading as one of their favourite activities. 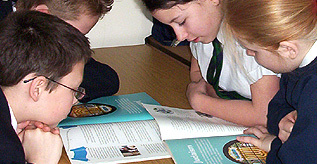 Literacy Project with Read Write Inc supporting schools with volunteers using proven methods of remedial reading teaching.